Make the most out of ripe Roma tomatoes by preserving them in this simple passata. Simply delicious on it’s with pasta or used in your favourite recipe. Once the unmistakeable scent of Autumn is in the air, the giant crates of ripe red Romas begin to appear at markets everywhere. They are perfectly plump, oval and a beautiful crimson colour. Their fresh herbal sweet scent is unmistakably one of my favourite smells in the whole word. It is so unlike any other scent you will ever smell. I find their presence very difficult to dismiss and every year the same thing happens. I buy an entire box. Then I lug it home and when I’m dragging it out of the trunk I think the same thing every year; What the heck was I thinking? The first year I bought a box, it sat in my garage for a while while I decided what to do with it. On the farm we didn’t ever really grow Roma tomatoes, only beefsteaks. I find it funny to think about it now because my grandma and mom always canned them. 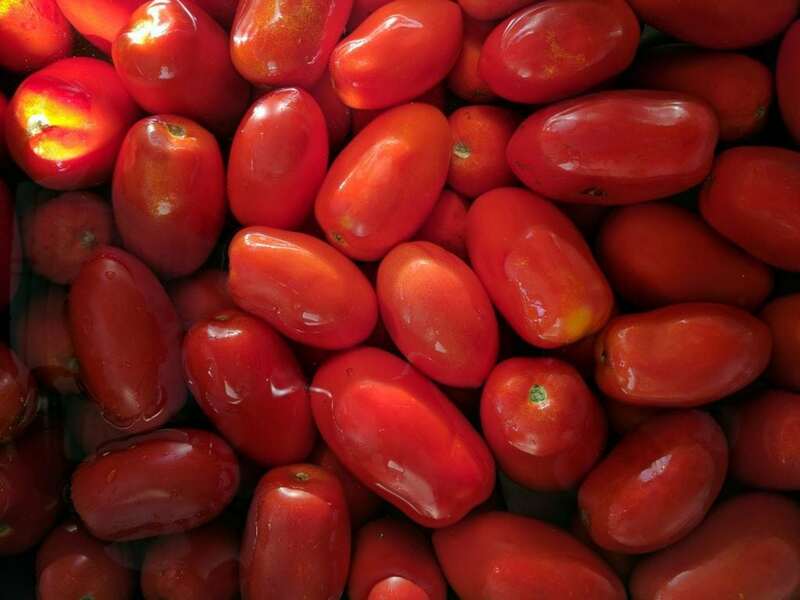 Beefsteaks are best for slicing and eating on sandwiches but Romas are the best for canning and sauces like Passata. Even though I had no longstanding Passata-making background I decided to give it a good old try. They say you never forget your first time. Those first two days of Passata making were interesting. I didn’t know what I was doing and honestly, I was just winging it. I thought the best way to begin was to peel the tomatoes. Peeling tomatoes takes hours of plunging them in and out of boiling hot water. It’s messy and really not much fun. I learned the hard way that all you really need to do is de-seed and dice the tomatoes. There’s a trick I learned in Thailand. Yes, Thailand! Place the tomato upside down on a board. Begin by using a sharp knife to make a shallow cut from the bottom point to the base. Be careful not to cut all the way through. Repeat the cuts 4 or 5 times and pry the slices away from the centre filled with seeds. You should have a strangely looking flower-like tomato. Finish by cutting every slice off at the base. Discard the core of seeds. 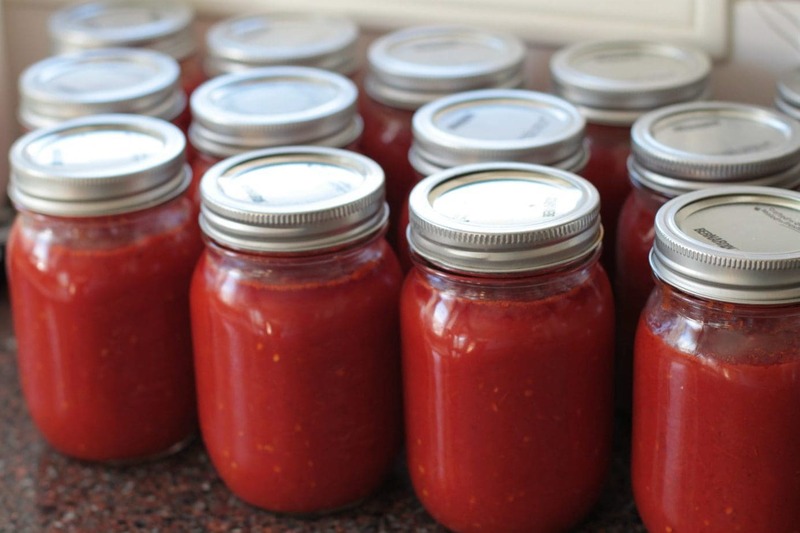 Make the most out of ripe Roma tomatoes by preserving them in this simple passata. It's delicous on it's own with pasta or used in your favourite recipe. Equipment: pint jars, lids, and rings. 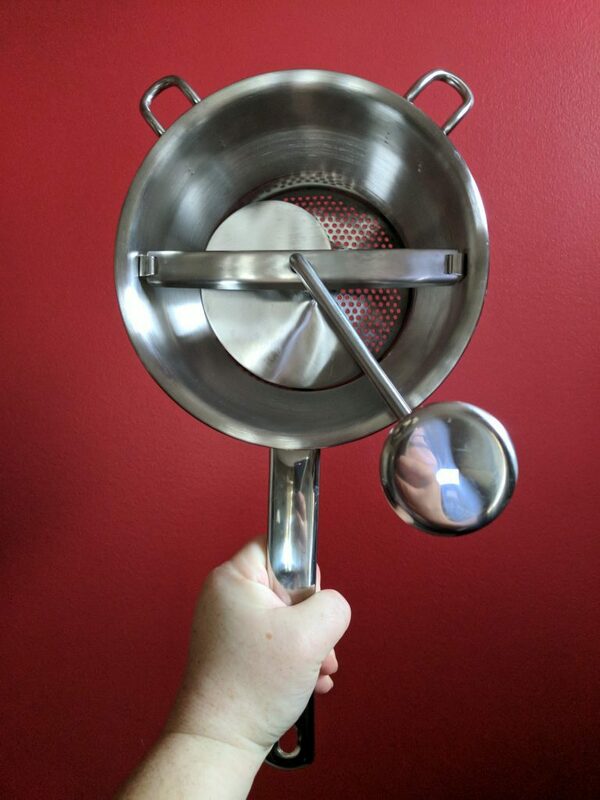 jar grabber, magnetic wand, hot water canner and rack, food mill, funnel. De-seed the tomatoes: Place the tomato upside down on a board. Begin by using a sharp knife to make a shallow cut from the bottom point to the base. Be careful not to cut all the way through. Repeat the cuts 4 or 5 times and pry the slices away from the centre filled with seeds. You should have a strangely looking flower-like tomato. Finish by cutting every slice off at the base. Discard the core of seeds. Place all diced tomatoes into a large pot (you may need to split it up into two pots). Add two passes of olive oil and 2 tbsp of sea salt (divide in half if using two pots). Bring to a boil. Reduce heat, cover, and let lightly simmer for 6 hours or until the sauce has reached your desired consistency. Allow the sauce to cool and pass it through the food mill to remove tomato skins. I usually process the sauce into jars the next day. Wash and inspect 10 half pint jars (I always do an extra jar just in case) and their lids. Be sure there are no chips on the jar rims and that there's no rust or dents on the lids. Place jars upside down in a large cake pan, add an inch or two of water. Place in a 250 F oven for ten minutes and keep warm until you are ready to fill them. Place lids and lid rings into a pot and fill with water. Set on stove and heat until they just begin to boil. Bring Passata back up to a slight boil. Remove hot jars from oven two at a time and fill with Passata using funnel. If you have fresh basil, drop a leaf into the bottom of each jar before filling. Quickly wipe rim of jar then cover with hot lid and screw on the sealing ring until it's just tight, but not crazy tight. 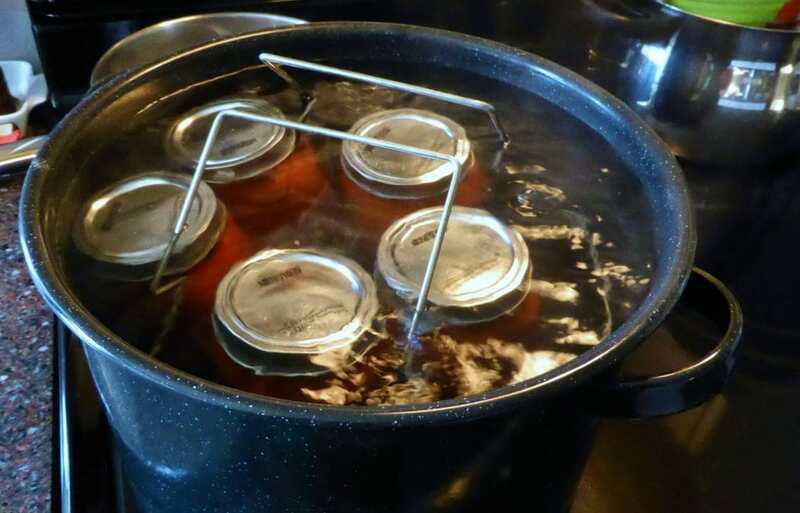 Place jar in canning rack and repeat until all your jars are finished. If your hot water canner looks too full of boiling water, remove some. If you need more, take it from the kettle. Lower the canning rack into the canner. Make sure there's an inch of water above the jars. 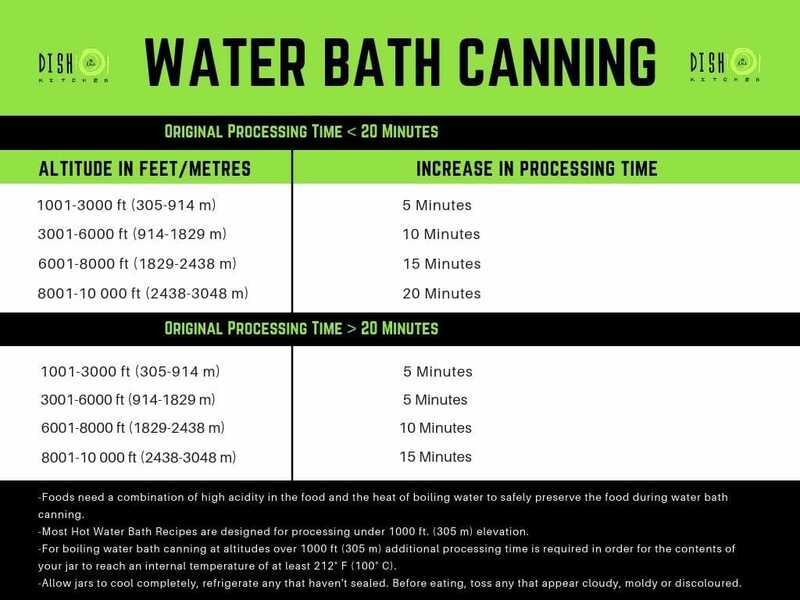 Process at a rolling boil for 10 minutes at sea level or 20 minutes at over 3000 ft altitude, adding boiling water as needed to make sure the jars are covered. Remove and let sit on counter overnight before moving. Check to make sure all jars have sealed (the lids should be depressed in their centres) and refrigerate any that have not sealed. What an interesting trick for seeding tomatoes! Brilliant. Who know I would pick up life skills while on vacation? We also learned how to make carrot roses and other fun garnishes. I wonder if my kids remember how? 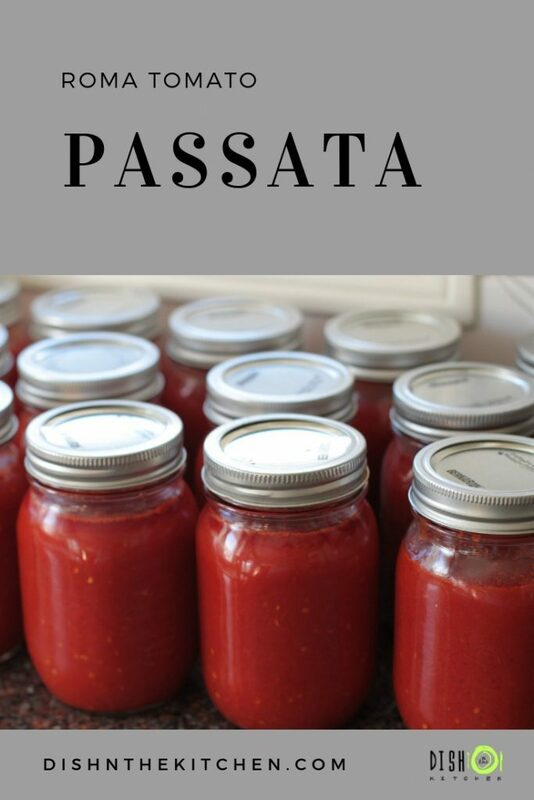 love homemade passata! 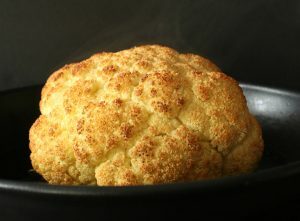 this looks great such a useful way to use vegetables! I agree! You also know that the sauce is as healthy as it can get because you control the ingredients. Such an informative post, Bernice! 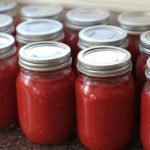 I am harvesting my romas right now ahead of the first frost, and this is a great way to use them. Love the seeding tutorial, too! That’s great to hear Colleen! What are your Roma growing tips? The tip on seeding a Roma tomato is brilliant!! 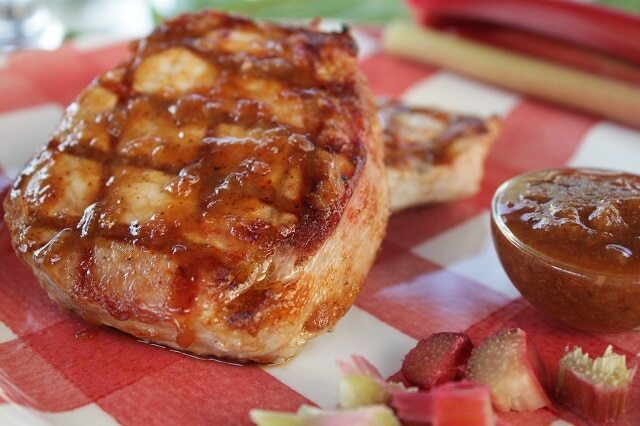 Thank you for sharing – great way to use my Roma tomatoes too! Happy seeding!Thanks for stopping by Jessica. I agree with you, Bernice. Roma tomatoes are so awesome for sauces like Passata. I love that they are denser and less juicy than other tomato varieties. No doubt that you will enjoy your beautiful tomato bounty during a snowstorm next February, right? 🙂 Happy Thanksgiving, Bernice! What a great way to de-goo a tomato!